Page 2 insult, we should care for one another and not destroy and hate. At the beginning of this semester several strategy meetings were held at CIACC to begin to resolve our difficulties. Unbelievable progress has been made toward this. I would like to offer all of you evidence that we are well on our way toward becoming once again a harmonious organization. 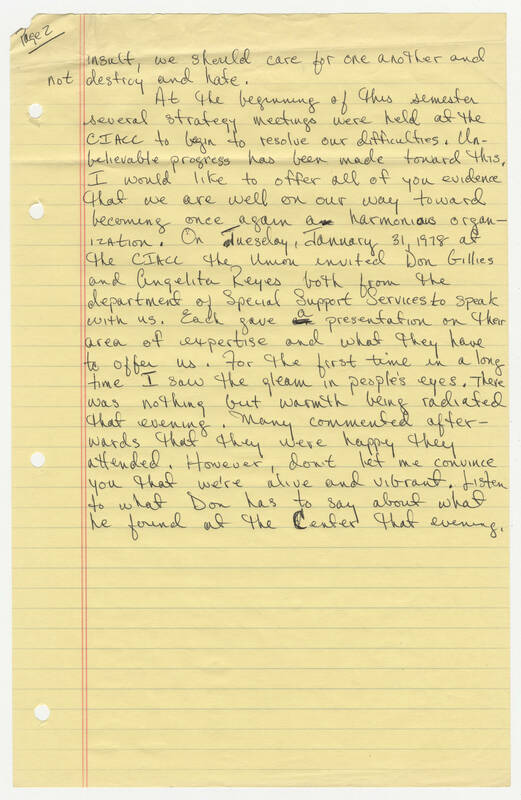 On Tuesday, January 31, 1978 at the CIACC the Union invited Don Gillies and Angelita Reyes both from the department of Special Support Services to speak with us. For the first time in a long time I saw the gleam in people's eyes. There was nothing but warmth being radiated that evening. Many commented afterwards that they were happy they attended. However, don't let me convince you that we're alive and vibrant. Listen to what Don has to say about what he found at the Center that evening.